1T=terrestrial; AA=affixed aquatic; SA=suspended aquatic. 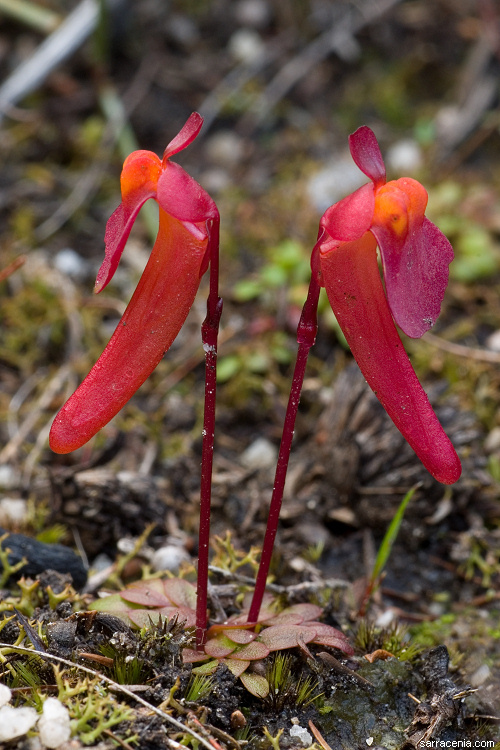 A: This Utricularia section is almost exclusively restricted to Australia, and is a very natural group of plants that share a number of similarities. All the traps are more or less similar, and furthermore are either at the ends of the leaves or on special stalks emerging from the peduncle base (i.e. they are not scattered willy-nilly, as is usually the case in the genus). The flower peduncles never bear scales, and (with almost no exceptions) the flowers are always either solitary or in whorls of two or more. However, there is plenty of room for interesting variation within this very large section. The flowers come in a great variety of colors and form, and the floral bracts have a wide variety. 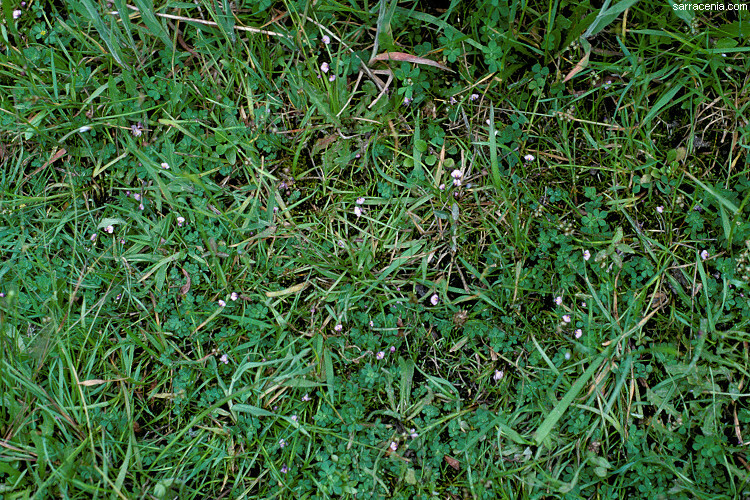 Also, the section includes a few extreme oddities like U. menziesii and U. tubulata. Ellison & Adamec (2018) suggest major changes in this section--most importantly, they split this into two sections. The changes are involved enough that I summarize them on the next page, while keeping my older treatment of Pleiochasia unchanged here. This is one of a small set of plants in the genus that is struggling for the status of having the largest bladders. Some are up to 1.2 cm across! 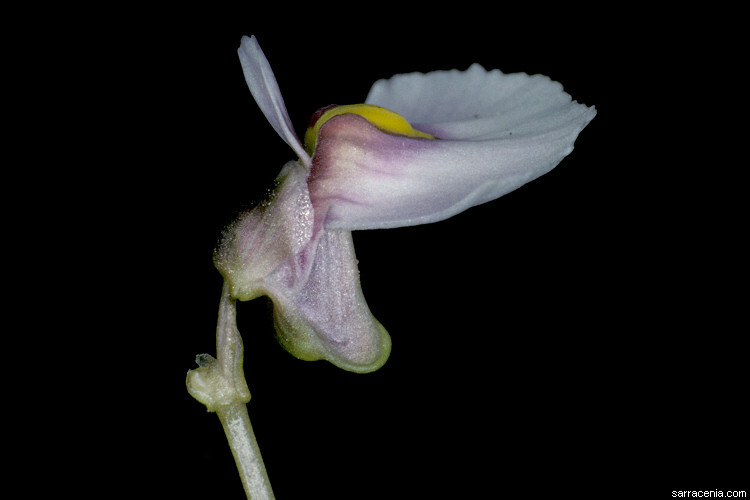 Other species with enormous bladders are Utricularia humboldtii and Utricularia reflexa. A species which must have evolved to beguile an as-yet unknown insect for pollination purposes, it has a flower that looks like cartoon of a frightened bug. The lower corolla lip has been transformed into five insect-leg-looking, threadlike lobes. 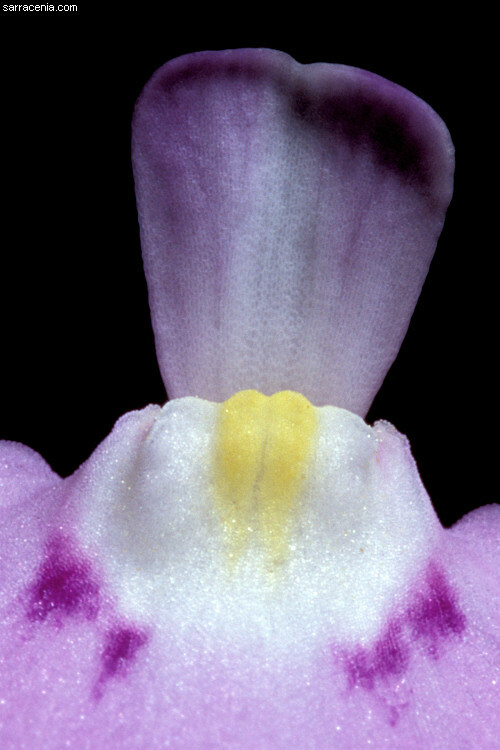 The upper corolla lip has transformed into a par of tall, erect antennae. This plant is similar to the related U. dunlopii. The spur....uh....is doubly bulged and is described as "scrotiform." I agree. The only species in the group that ventures off Australia--it also occurs in New Zealand and New Caledonia. 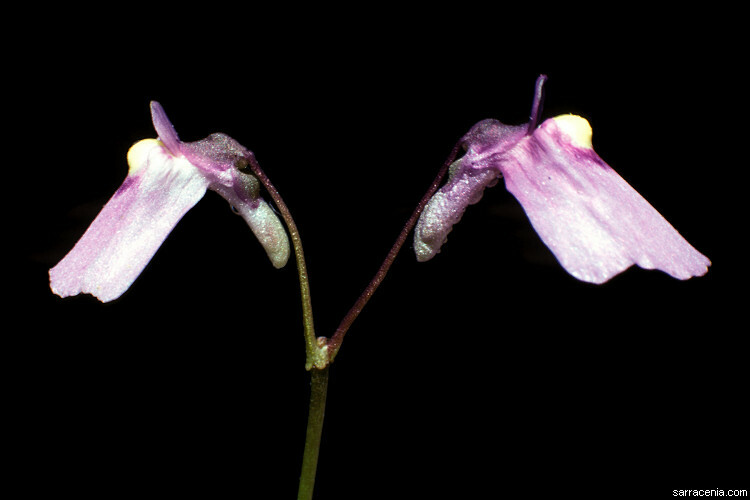 The species formerly known as Utricularia novae-zelandiae and Utricularia monanthos (both of which I loved very much) have been grouped into this species--a bitter decision I have taken years to accept. The flowers of this species are often delicately and attractively scented. This is the easiest plant in the section to grow, in my experience. 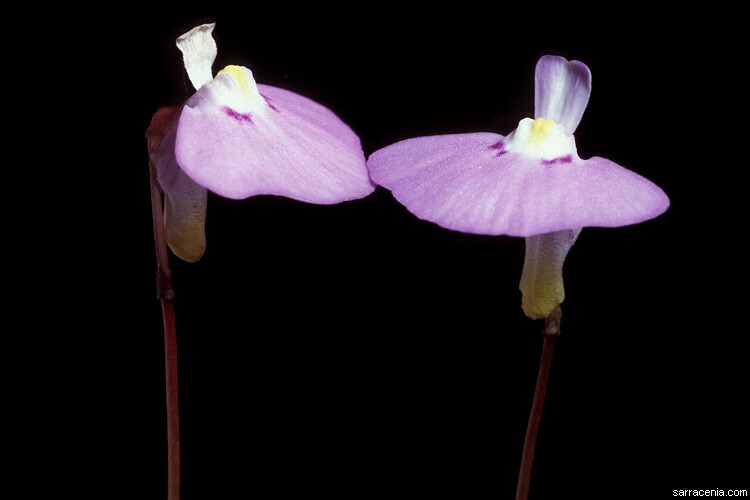 The species Utricularia ameliae R.W.Jobson and Utricularia fenshamii R.W.Jobson are tentatively treated as a variety of this plant. Another of the six species in the genus that have curiously insect-like flowers because of erect antennae-like flower lobes. However, unlike in U. capilliflora, U. dunlopii or U. lowriei, the "antennae" of this plant emerge from the lower corolla lip. 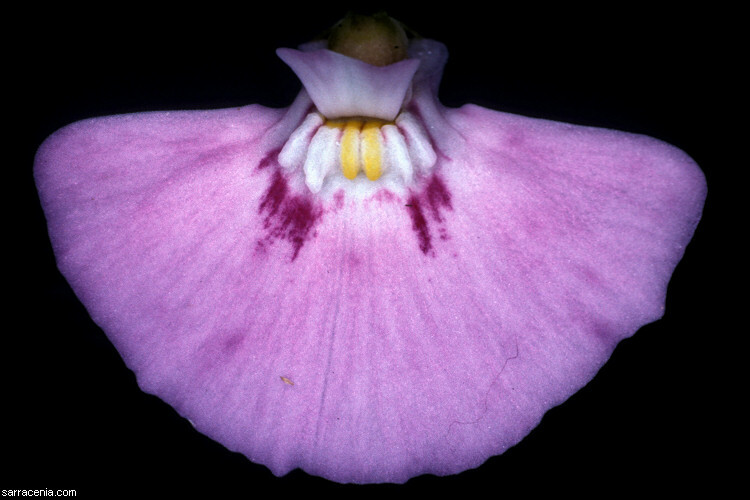 The rest of the flower is highly reduced, like U. antennifera and U. albertiana. 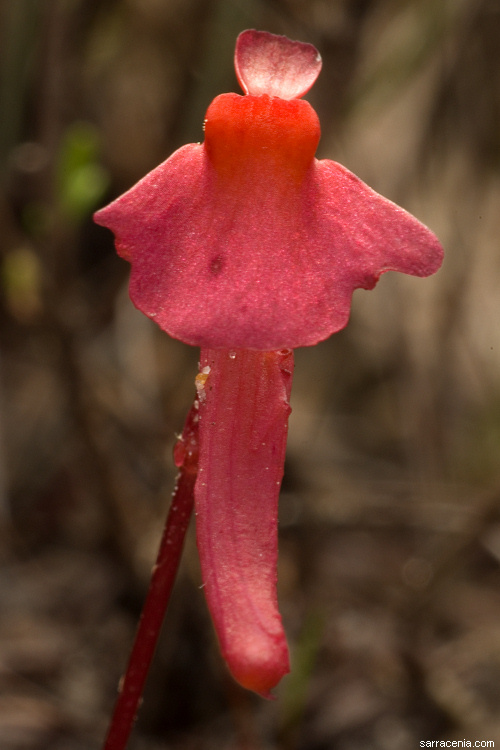 A small flowered species with a comparatively large spur. A fairly unmemorable plant that is not all that much. I mention it only because I really like the plant's name. It rolls off the tongue quite dramatically. 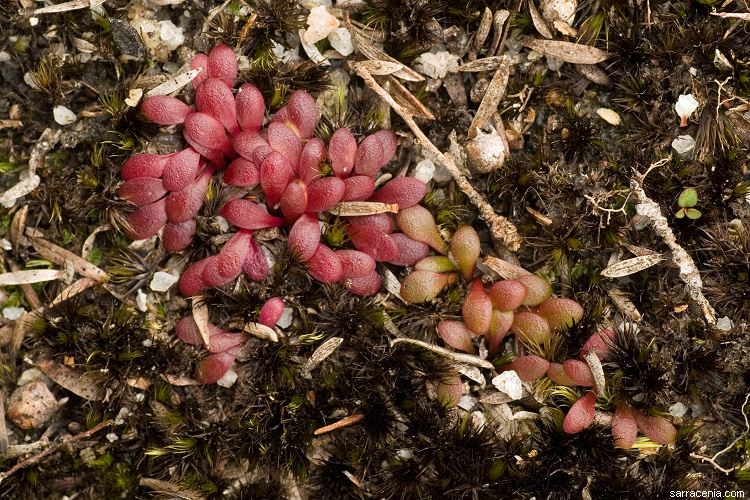 Also, it seems likely that U. linearis Wakabayashi is a collection of this species. This is perhaps one of the strangest species in the entire genus. The flowers are beautifully bright red and yellow, and have an enormous drooping, fat spur that dominates the plant's appearance. The rosette of leaves is comparatively small and inconspicuous. What really makes this plant peculiar is the presence of underground tubers at the inflorescence rosette that helps the plant survive dry periods. Here in a genus of terrestrial and sub-affixed plants, we find this entirely aquatic species with leaves in whorls. It has strange seeds which are covered with elongated bumps that I am struggling to try to explain--imagine stubby little fingers (botanically they are called papillae). The flowers are on long, fat inflorescences, and have delicate spurs. A true oddity. I cannot say I am convinced by Taylor's reasoning to place this species into this section. Very similar to Utricularia dichotoma in form, this plant has really wonderful flowers that look to me like little butterflies flitting in the air. I am particularly fond of this species. This is a notheworthy plant I have grown on a few occasions as an affixed aquatic. It has long leaves that are arranged in a rosette, and each rosette produces long stolons that produce additional plantlets. Page citations: Adamec, L. 2006 (pers. comm. ); Fleischmann, A. 2015; Jobson, R.W. 2012, 2013; Jobson, R.W. et al. 2018; Rice, B.A. 2006a; Taylor, P. 1989; Wakabayashi, H. 2010b; personal observations.